There they are, Kilian pushing his huge plastic monstrosity of a car (think Fred Flinstone meets Little Tykes) up the driveway, with Penelope pulling the car along by a jumprope looped around the steering wheel. I can’t hear them, but I imagine she’s bossing, and he, a boy of few words, is going along with it happily. As I watch, Kilian climbs in, Penelope pulls, and down the gentle slope of the driveway they go. I step closer to the window. Kilian’s feet stick out from under the car. He must have slid off the seat when his little legs couldn’t keep up, and the whole toy car has rolled over him. I’m about to dash outside to shout a panicked, Are you hurt? and to my daughter, Be careful! Penny and Kilian with their boy-eating car. Penelope stops pulling. She pushes the car off her brother easily (it’s not heavy). And soon he’s back up in the seat, running his Fred Flinstone feet along beneath him. This time he steers straight for the edge of the drive and tucks his feet up as his car bump, bump, bumps over the grass and down the hill into the lower part of yard. He’s not afraid of the larger slope. He already fell and got up and discovered something important: He’s OK, and he is Brave. Their happy laughter joins cicadas and evening birdsong, and I watch a while longer before reluctantly calling them in for baths and bed. Throughout the evening I’m aware of how atypical my response was. My first inclination is always to step in, to protect, guide. But because I’ve read all the articles about the dangers of hovering, overprotecting, my inclination wars with my intellectual desire to give my children space to explore, express their creativity, and make mistakes. I agree with those articles—let the children play! We’re too assessment-focused, milestone-obsessed, cautious. My oldest child is deep in the throes of college applications, and the test scores make or break his day or his week. They amp up his anxiety—will he get into the college he most wants to attend? Can he control the future? But I like the idea of On Track. I like assessments. I like to know where my children fit, their percentiles and rankings and benchmarks, oh my! Besides, aren’t benchmarks and assessments important? Aren’t they valuable for class placement and for spotting developmental issues? I mentioned that Kilian is a boy of few words. 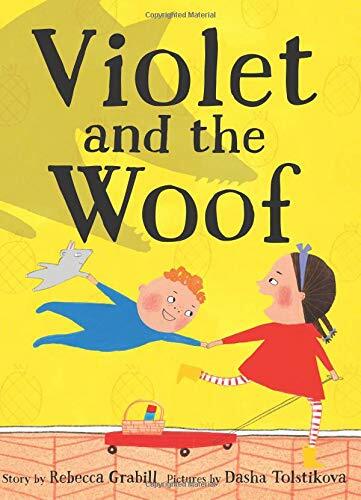 I didn’t mention that Kilian, the inspiration for “Peter” in my book Violet and the Woof, has a profound speech disorder called Childhood Apraxia of Speech. I knew virtually nothing about speech pathology when Kilian was born. Despite having had two “late talkers” a decade ago, I never bothered with formal assessments, and while one received speech therapy for a short while, it was a blip I hardly noted. I knew as only a mother knows that they were fine. Their little minds were busy with other things (turns out now that they’re 18 and 15, I was right). I want something, someone to tell me he’s going to be OK. In my book, Violet and the Woof, Peter is about 18 months old, the age Kilian was when I wrote the story. When one reviewer noted, rather snidely, that Peter’s only word is “Woof,” I am painfully aware that my living breathing “Peter” can still not, at four, say Woof. Assessment, caution, intervention, they have value. Without the proper assessment, how will I know if my child will be OK? Because, you see, I’m not brave. I’m very, very afraid. The little children are in bed, the teens doing homework. I sit down with the book that just arrived a day or so previous, a 400 page tome about Apraxia. I flip the page, but I’m not really reading. I’m thinking about the wisdom of allowing Penelope to pull Kilian around in a plastic car by a jumprope. I’m thinking about the value of taking risks, of facing problems, of overcoming them. What if I had rushed in? What if I’d stormed outside to lecture on safety, to coo poor baby over any bump or bruise? I fought hard to get Kilian’s speech assessment. I stepped in when needed, and I must also step out. I’ll take Kilian to speech therapy. I’ll show him for the hundredth time how to form the word Mama with his lips together instead of with his top lip against his teeth. But had I rushed out the door, I would have robbed Penelope the opportunity to show compassion for her brother, to feel concern for him, and to feel the subsequent satisfaction from helping him. I’d rob her of the chance to see for herself that pulling Kilian’s car around by a jumprope requires more care than she’s used to giving things. I would have stolen from Kilian the triumph of being OK and being Brave. Being OK, being Brave. Both are things he will very much need in the coming years. I will step in when needed, and I will also step out. Because being OK, being Brave, I need to learn those things, too. Peter and Violet, Violet and Peter. Siblings who learn together how to be OK and how to be Brave. What about you? How do you know when to step in and when to step out?